Visit Kakku pagodas with us! Kakku Pagoda Complex,Taunggyi features a cluster of fantastic ancient monuments and is located in the heart of Shan State. 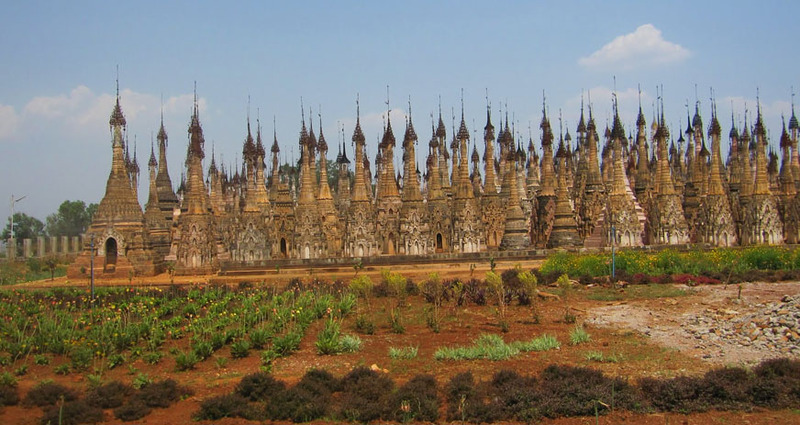 It is mainly a group of thousands of pagodas and temples which were built in the 16th century. This popular tourist attraction in the city attracts a huge number of travelers every year who come to visit the ancient temples and Buddhist Pagodas. These are of great historical importance due to their existence dating back from 2000 years. Kakku Pagoda Complex, Taunggyi draw the attention of visitors throughout the country as well as the other major countries of the world. Kakku Pagoda Complex in Taunggyi was established by Pa-O people who were the local residents of the southern Shan State and Thaton area. Kakku is situated 26 miles south of Taunggyi and bordered by Naung Mon Township in the east. The region is strategically located on the blue mountain ranges and above 1300 meters of sea level. The entire region of Kakku is covered by Pa-O villages and boasts of beautiful natural landscape where the Pagodas and temples can be seen. The Kakku Pagoda Complex is a popular tourist attraction site and was allowed to be visited by the tourists very recently. Visitors can get to see the natural vegetation and cultivation along the roads which leads to the Pagoda Complex. They have ample scope of watching the lifestyle of Pa-O tribal people and have a sneak peek at their culture. One can have an insight of the traditional lifestyle of these people who made the foundation of the amazing Pagoda Complex.